Summary: Here is the best workflow of ripping and converting Blu-rays to H.265 MP4 videos, so that you can play them on Plex smoothly. Most users would like to use Plex app to stream and play local videos, music, or photos between browsers, mobile devices, game consoles, streaming devices, home theater PCs. Generally, it supports videos in H.264 MP4, H.265 MP4, H.264 MKV, H.265 MKV formats and audios in AAC, ALAC, FLAC, MP3, M4A, WAV, etc. How about the physical Blu-rays? Is it possbile to play Blu-rays on Plex Media Player? Here's my answer. Actually, Plex can recognize video formats in Blu-rays discs, the best solution for you is to Rip Blu-ray to Plex compatible H.265 MP4 videos for streaming and playback, as a matter of fact, latest H.265 /HEVC codec promises a 50% storage reduction while remain its original video quality. To finish the task, you can take advantage of Brorsoft Blu-ray Ripper for Windows / Mac, which is capable to rip any (protected) Blu-rays to H.265 MP4 video in ultra fast speed and excellent quality. Besides, it also provides more regular video formats like H.264 MP4, MKV, AVI, WMV, MOV, FLV, WMV, etc. for playing on multimedia devices including: iPad, iPhone, Samsung TV, Xbox, PS3/P4 etc. Install and run the Blu-ray Ripper and click "BD/DVD disc" icon to load your Blu-ray movies to the program. BDMV folder, ISO file are also supported here. 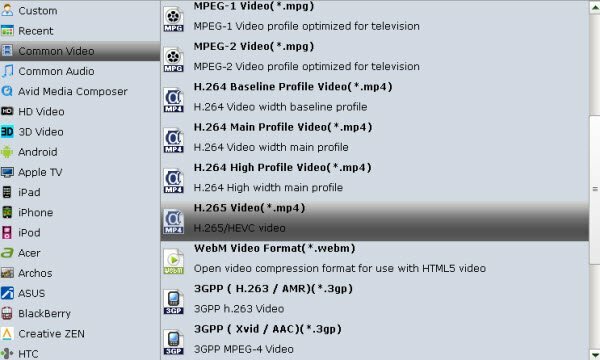 Click the "Format" bar, select "Common Video" from the format list and in sub-menu you can find "H.265 Video(*.mp4)" as your output. Tip:You can click "Settings" icon to adjust the video, audio parameters bitrate, frame rate, sample rate, audio channel, etc. Once the conversion is done, clike open button to quickly locate the output file and add them into Plex Media Sever. If you don't know how to set up plex media server and client, check this tutorial: Set Up Plex Media Server and Plex Client. Now you can effortlessly play the converted Blu-ray movies on Plex Media Player with families and friends. If you not only want to rip any Blu-ray, but also intent do rip DVDs or convert HD Videos such as 4K XAVC/XAVC-S, MXF, MTS, WMV, M4V, AVI videos for Plex Media Player, , Brorsoft Video Converter Ultimate (or iMedia Converter for Mac) will be your first and best choice.